Can’t figure out how to start a scene? Here’s a quick exercise to help you design the main elements of the scene— the goal, the conflict, the consequences. Get out a scene you're working on, and let's see about drafting and then revising. 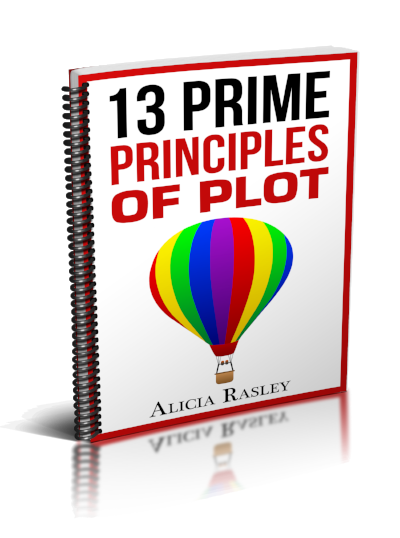 A lot of writers bore themselves by planning a scene too much in advance. This scene, how about just sketching the very basic events? Try choosing a big scene, like The Reversal, or The Point of No Return, a scene where something important happens. Scene Goal: (Heroine wants to impress in the interview because she wants the job)- How do you show this? Setup: Keep this to a minimum if you can, maybe a paragraph at most before things really get started, so no long walk from the parking lot through the hallway to the interviewer's office. Maybe start with her knocking on the door or telling the receptionist she's here. Central event: The interview where the interviewer keeps asking "ambush questions" like-- "You majored in history? Why did you do something stupid like that?" Or ... "Hmm. Your hobby is knitting. Are you one of those women who knits during business meetings?" Result: This doesn't have to be the ultimate result of her finding out if she got the job or not. This is the result of the immediate scene conflict. Like as she walks out of the interview, someone congratulates her, and she says, Oh, I blew it, and he winks and says, "That's not what I hear." In other words, have an actual ENDING. Make sure you end with something that closes the scene but propels into the next scene, when she's maybe on her first day at the new job. Just a quick scene design to help you build to the event and then to show the beginnings of the consequences. But notice, the "big event" isn't just her getting her goal (the job), but rather the conflict event that puts the goal into doubt. Now let's bring in INTERNAL. That is, let's see how this basic scene schematic can be individualized and deepened by adding in the internal component, what the character subconsciously desires and fears. So as you write the scene, consider how the overall character goal and motivation are going to be advanced in this scene. Of course the scene itself has a goal and conflict and all that, but it also advances the book plot (for example, the quest to solve the murder mystery). So consider that there is a booklength external conflict and a booklength internal conflict. And there are major internal and external motivations that guide the character through every event in the story. Even if every scene has a goal, you don't need separate motivations and conflicts for each scene; rather the goal is likely to be pieces or aspects of the larger one, a step toward achieving the goal. And the conflict is the event that gets in the way of the goal, or the piece of the overall "big' conflict that arises because of this situation. Let me come up with an example. Hmm. I have a character, Theresa, who was adopted when she was 7 by a wealthy family. She's in her 30s now and has had no contact with her birth family since the adoption. So she comes back to her hometown and decides to find her parents. That's her overall goal for the whole book time. Motivation-- that is, why does she want that goal? She might have both external and internal motivation? Her -external- motivation is the one she can state out loud to anyone who asks. External motivation: I remember I had siblings, and want to see them again. What's her -internal- motivation, what is driving her from within but she can't at this point quite acknowledge? Internal motivation: I've always felt like the outsider in my adoptive family, and maybe my birth family will make me feel like I belong. Now external conflict is often what's between her and the goal, or the problems and issues pursuing the goal bring up in her. (There are other genesises <sp> of conflict, but those are good ones.) So what's her external conflict? External conflict: Her adoptive mother doesn't want her to find her parents, and is making it hard. What internal problem/issue is also hampering her or making trouble? Internal conflict: She unconsciously thinks that the reason she was given up for adoption and the reason her new family never really "fit" is because there's something wrong with her. Okay! That's all the BOOK stuff-- the overall character insight I know that affects the entire book. Now how does that apply to a scene? I think what I need to do is to look at the scene and decide what piece or aspect of the book-long goal is pursued here. Where are we in the story? It's still early. She's formulated the goal, but she hasn't encountered the conflict yet (her adoptive mother- "Mom"). Right away, I think—it's time to encounter the conflict! This scene she's going to start trying to achieve her goal, but then encounter the conflict that tells her it's going to be harder than she imagined, because Mom is going to get in the way. So let's say this is the scene where she goes to the courthouse to find the birth records. Her goal for the scene: Get my birth certificate. Notice this is only a piece or step of the book-length goal. But in order to track down her birth-parents, she first has to find out who they are, and that's the "step" for this scene—her scene goal. Her external motivation for the scene: My birthparents' names will be on the birth certificate, and I want to know that. Also, I need the birth certificate to get other records. Again, this isn't the "big motivation" of reuniting with her siblings, but a very scene-focused motivation—why she wants the scene goal. Now comes the all-important scene conflict. Remember, this isn't the whole external conflict, but just the piece of it that is getting in the way of this particular scene goal. External conflict: The clerk who finds it, and then says, "Does your mother know you're doing this?" and keeps her waiting while he makes a phone call.... to her mom, presumably. Internal conflict: She's afraid of what she'll find if she does get the birth certificate... maybe mom is trying to protect her from finding out that her parents were famous serial murderers. Again, this is only a piece of the big internal conflict. But notice that there's a hint here that "there's something wrong with me" that connects to her overall internal (unrecognized) conflict. NOW... how does this all affect her SCENE ACTIONS? Pursuit of goal in scene: She goes to the courthouse and demands the birth certificate. External conflict: Clerk starts to call Mom. IOW, her internal conflict of being afraid of what she might find makes her ambivalent about achieving the goal. BUT… it's not ACTION unless she DOES something, right? So she how can she show that she's ambivalent? She can say, "Never mind then," and start towards the door, but then turn back and point at the receiver in the clerk's hand. She can wait with her hand on the door until the clerk hangs up without making the call. Then she can say "Thank you" and leave. See how that expresses her internal conflict (maybe Mom is right and I don't want to know) and external conflict (all I know is, I really don't want Mom to know) through action, not just her thoughts. But remember the effects or consequences of the conflict? That's how you move from this conflict into the next scene, how you make the step deeper into the story. So- consequences! When the clerk picks up the phone again (forcing the conflict again) to call her mom, however, the larger conflict between her and mom fires her anger and forces her into real action (she steals the birth certificate off his desk, maybe). Think of the motivation and conflict as pullers and pushers. The motivation pulls her towards the goal, but the conflict is shoving her from behind or shoving her back or shoving her in another direction. How is that going to play out in this scene? Consider that every scene has "Goal Motivation and Conflict," but no one scene will have the entire larger book-length GMC. Rather they're all going to be aspects or pieces of the larger GMC. And what's important is-- how do they impel this character to act and react at this moment? ACTION is the ultimate purpose of motivation and conflict-- to cause the character to do something she has to do to be in this story, to move one more step towards her goal or away from the relative comfort she enjoyed before this story got started, before she started going after the goal, before she confronted the conflict. External motivation for the scene. Again, this isn't the "big motivation" for the whole book, but a very scene-focused motivation—why she wants the scene goal. Internal motivation for the scene. Again, not the "big book internal motivation," but what she kind of secretly wants in this moment in this scene. External conflict: Remember, this isn't the whole external conflict, but just the piece of it that is getting in the way of this particular scene goal. Internal conflict: Again, this is only a piece of the big internal conflict. NOW... how does this all affect the character SCENE ACTIONS? What does the character do to pursue of goal in scene? What action/event shows the external conflict in the scene? What action/event shows the internal conflict in the scene? What action or event near the end of the scene shows the effects or consequences of the conflict? That's how you move from this conflict into the next scene, how you make the step deeper into the story. Just jot down what you think might work for each of those elements. Then read over what you've listed, and start drafting the scene!